The plastic surgeons at Richmond Aesthetic Surgery announce the practice’s expansion to a new office location in Short Pump, Virginia. 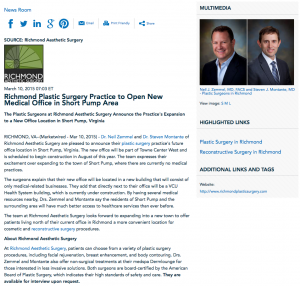 Richmond, VA – Dr. Neil Zemmel of Richmond Aesthetic Surgery is pleased to announce his plastic surgery practice’s future office location in Short Pump, Virginia. The new office will be part of Towne Center West and is scheduled to begin construction in August of this year. The team expresses their excitement over expanding to the town of Short Pump, where there are currently no medical practices. The surgeons explain that their new office will be located in a new building that will consist of only medical-related businesses. They add that directly next to their office will be a VCU Health System building, which is currently under construction. By having several medical resources nearby, Dr. Zemmel says the residents of Short Pump and the surrounding area will have much better access to healthcare services than ever before. The team at Richmond Aesthetic Surgery looks forward to expanding into a new town to offer patients living north of their current office in Richmond a more convenient location for cosmetic and reconstructive surgery procedures. At Richmond Aesthetic Surgery, patients can choose from a variety of plastic surgery procedures, including facial rejuvenation, breast enhancement, and body contouring. Dr. Zemmel also offers non-surgical treatments at the medspa Dermlounge for those interested in less invasive solutions. Both surgeons are board-certified by the American Board of Plastic Surgery, which indicates their high standards of safety and care. He is available for interview upon request.